Jacque13 - Minnesota Great but size up! "My son drives a grizzly 4wheeler so wanted this helmet due to the bear on the side. It’s a great looking helmet and he loves it. 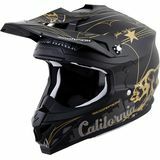 Only piece of advice is to size up - we had to exchange for a larger size and the exchange process was easy & painless - highly recommend the helmet & the company." 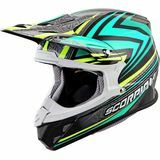 DW112AL Scorpion Helmet "Light weight, great quality helmet. The best part is the price. Just as good as the high dollar helmets in my opinion. Used with 100% goggles and was perfect."